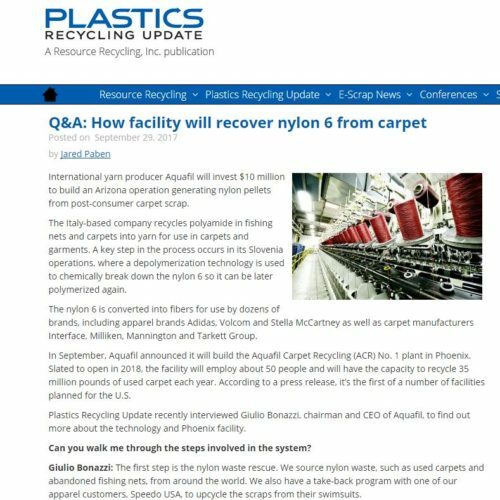 Aquafil - How facility will recover nylon 6 from carpet. How facility will recover nylon 6 from carpet. International yarn producer Aquafil will invest $10 million to build an Arizona operation generating nylon pellets from post-consumer carpet scrap. The Italy-based company recycles polyamide in fishing nets and carpets into yarn for use in carpets and garments. A key step in the process occurs in its Slovenia operations, where a depolymerization technology is used to chemically break down the nylon 6 so it can be later polymerized again. The nylon 6 is converted into fibers for use by dozens of brands, including apparel brands Adidas, Volcom and Stella McCartney as well as carpet manufacturers Interface, Milliken, Mannington and Tarkett Group. 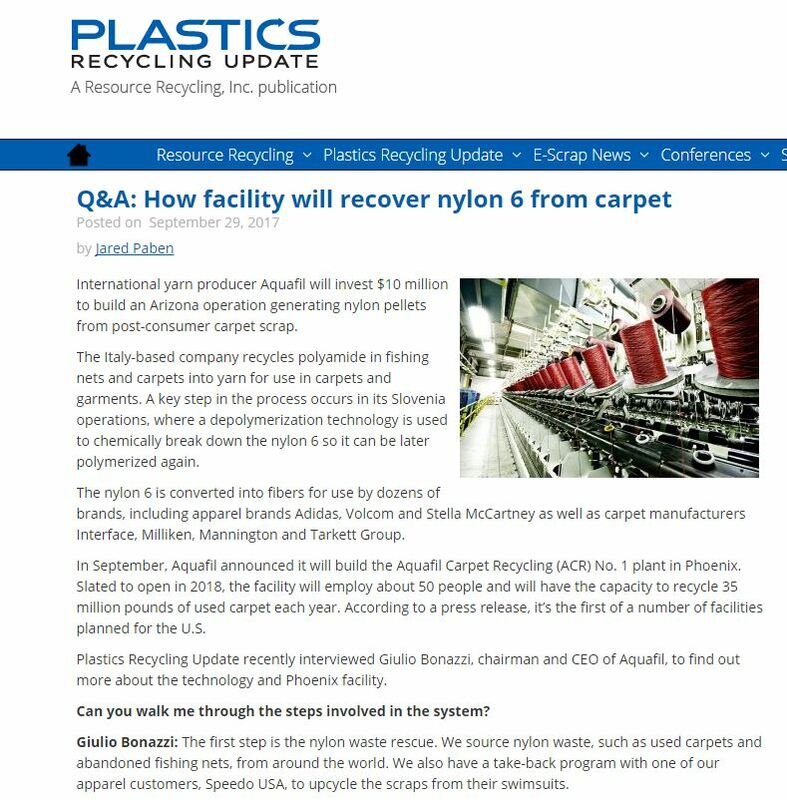 In September, Aquafil announced it will build the Aquafil Carpet Recycling (ACR) No. 1 plant in Phoenix. Slated to open in 2018, the facility will employ about 50 people and will have the capacity to recycle 35 million pounds of used carpet each year. According to a press release, it’s the first of a number of facilities planned for the U.S.
Plastics Recycling Update recently interviewed Giulio Bonazzi, chairman and CEO of Aquafil, to find out more about the technology and Phoenix facility. Can you walk me through the steps involved in the system? Giulio Bonazzi: The first step is the nylon waste rescue. We source nylon waste, such as used carpets and abandoned fishing nets, from around the world. We also have a take-back program with one of our apparel customers, Speedo USA, to upcycle the scraps from their swimsuits.